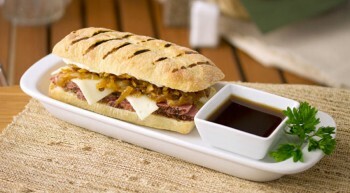 Vanee Au Jus is made with rich beef stock, and fully seasoned with black pepper, onion, and beef flavors. Perfect for French dips, Italian beef, beef roasts of all kinds, or as a holding medium for proteins. 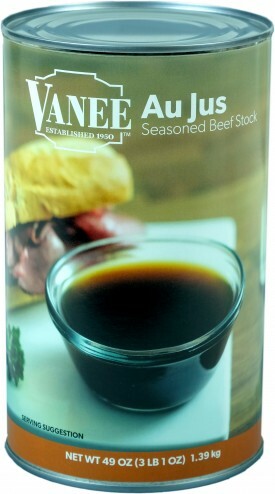 Vanee Au Jus has no added MSG, is shelf-stable for easy storage, and takes all of the time, labor, and guesswork out of making a rich, savory au jus. Each 49 oz. can yields 46 two-tablespoon servings, for a total of 552 servings per case. Use for French dips, prime rib, or as a holding medium for burger patties or roasts. Beef Stock, Salt, Hydrolyzed Soy Protein, Onion Powder, Sugar, Flavor (Hydrolyzed Soy, Corn, and Wheat Protein, Corn Syrup Solids, Thiamine Hydrochloride, Disodium Inosinate, Disodium Guanylate), Caramel Color, Citric Acid, Beef Extract, Garlic Powder, Flavoring.